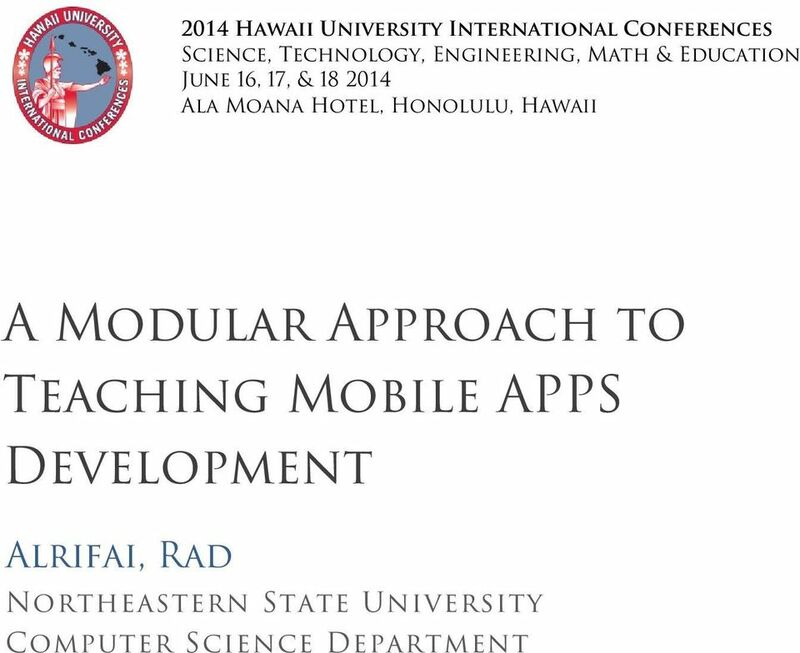 Download "A Modular Approach to Teaching Mobile APPS Development"
2 Rad Alrifai Computer Science Department Northeastern State University A Modular Approach to Teaching Mobile APPS Development Synopsis: To better relate mobile applications development to other topics from computer science and adapt to the continuous evolution in the mobile development environment, apps development course content is organized as a model consisting of five modules. 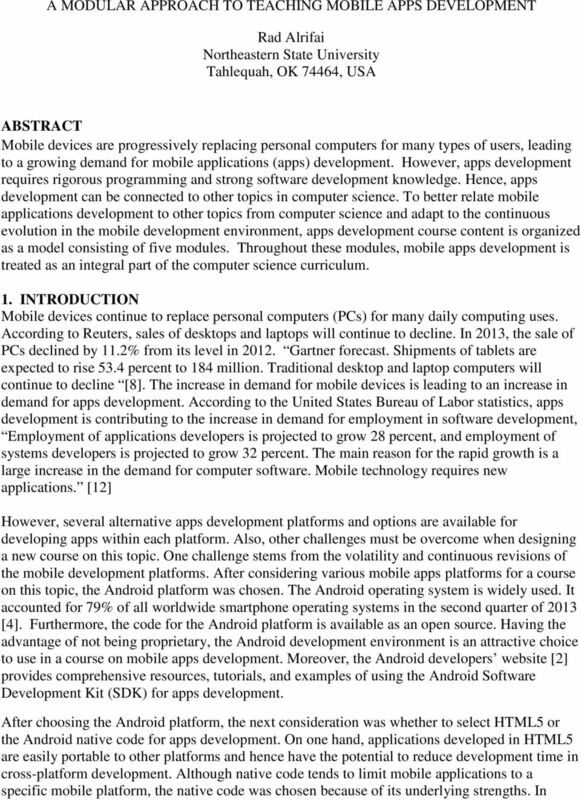 Throughout these modules, mobile apps development is treated as an integral part of the computer science curriculum. 5 Objectives/Outcomes . Thus, the course learning objectives are organized into three categories: what the student should learn to do, know, or consider. The layered approach has been widely used in computer science. Organizing a system into components is common in many areas of computer science including the OSI-RM, TCP/IP , software development life cycle, client/server architecture , and the model-view-controller (MVC) approach . Thus, the modular approach will present mobile applications development in a manner that is familiar to computer science students. In addition, software design, coding, implementation, testing, and maintenance are easier, more flexible, and extendable with the modular approach. The modular design organizes course content into five modules. The first three modules, the presentation, data, and application logic, find root in both the three-tier client/server architecture  and the MVC approach. The application components separate data storage, business logic, and the visual representation of the data. 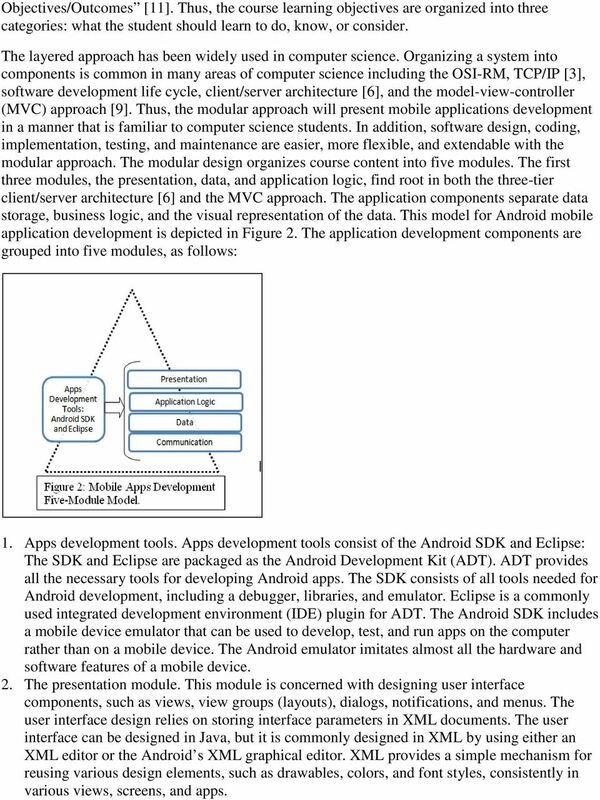 This model for Android mobile application development is depicted in Figure 2. The application development components are grouped into five modules, as follows: 1. Apps development tools. Apps development tools consist of the Android SDK and Eclipse: The SDK and Eclipse are packaged as the Android Development Kit (ADT). ADT provides all the necessary tools for developing Android apps. The SDK consists of all tools needed for Android development, including a debugger, libraries, and emulator. Eclipse is a commonly used integrated development environment (IDE) plugin for ADT. 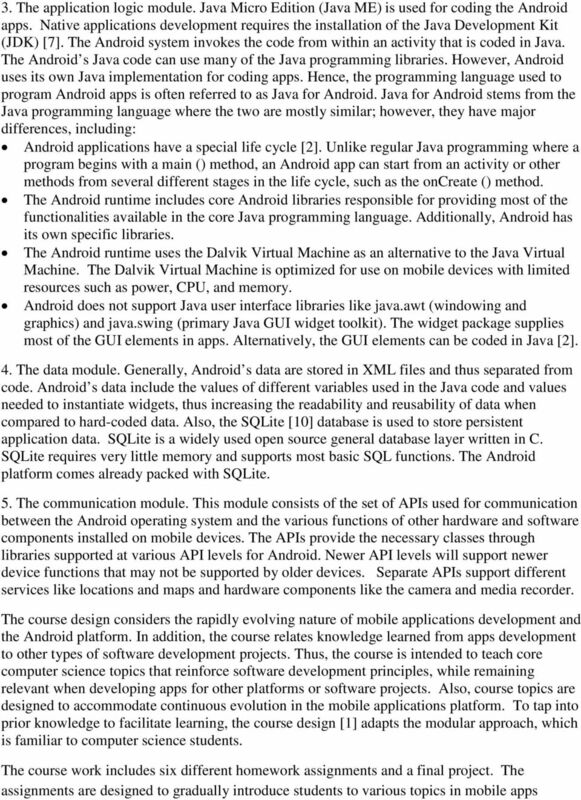 The Android SDK includes a mobile device emulator that can be used to develop, test, and run apps on the computer rather than on a mobile device. The Android emulator imitates almost all the hardware and software features of a mobile device. 2. The presentation module. This module is concerned with designing user interface components, such as views, view groups (layouts), dialogs, notifications, and menus. The user interface design relies on storing interface parameters in XML documents. The user interface can be designed in Java, but it is commonly designed in XML by using either an XML editor or the Android s XML graphical editor. XML provides a simple mechanism for reusing various design elements, such as drawables, colors, and font styles, consistently in various views, screens, and apps. 7 development and aligned with the purpose of the corresponding modules of the introduced model. The first assignment introduces students to apps development tools and the Android development environment where students modify user interface and programming logic of existing apps. Subsequent assignments progressively introduce other modules from the mobile apps development architecture. 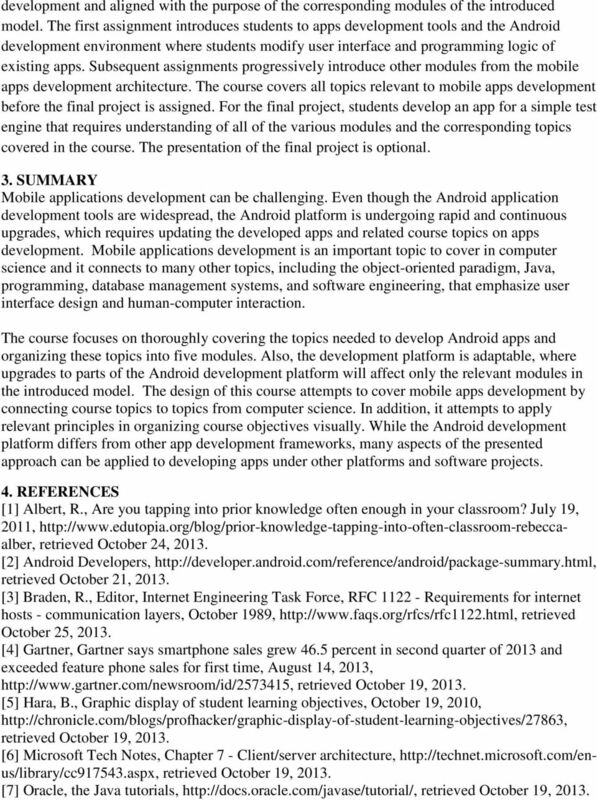 The course covers all topics relevant to mobile apps development before the final project is assigned. For the final project, students develop an app for a simple test engine that requires understanding of all of the various modules and the corresponding topics covered in the course. The presentation of the final project is optional. 3. SUMMARY Mobile applications development can be challenging. Even though the Android application development tools are widespread, the Android platform is undergoing rapid and continuous upgrades, which requires updating the developed apps and related course topics on apps development. Mobile applications development is an important topic to cover in computer science and it connects to many other topics, including the object-oriented paradigm, Java, programming, database management systems, and software engineering, that emphasize user interface design and human-computer interaction. The course focuses on thoroughly covering the topics needed to develop Android apps and organizing these topics into five modules. Also, the development platform is adaptable, where upgrades to parts of the Android development platform will affect only the relevant modules in the introduced model. 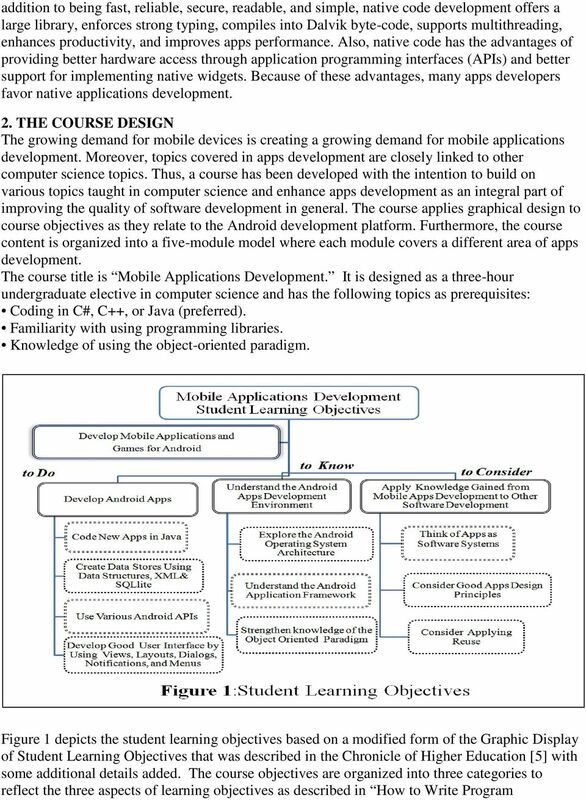 The design of this course attempts to cover mobile apps development by connecting course topics to topics from computer science. In addition, it attempts to apply relevant principles in organizing course objectives visually. While the Android development platform differs from other app development frameworks, many aspects of the presented approach can be applied to developing apps under other platforms and software projects. 4. REFERENCES  Albert, R., Are you tapping into prior knowledge often enough in your classroom? July 19, 2011, retrieved October 24,  Android Developers, retrieved October 21,  Braden, R., Editor, Internet Engineering Task Force, RFC Requirements for internet hosts - communication layers, October 1989, retrieved October 25,  Gartner, Gartner says smartphone sales grew 46.5 percent in second quarter of 2013 and exceeded feature phone sales for first time, August 14, 2013, retrieved October 19,  Hara, B., Graphic display of student learning objectives, October 19, 2010, retrieved October 19,  Microsoft Tech Notes, Chapter 7 - Client/server architecture, retrieved October 19,  Oracle, the Java tutorials, retrieved October 19, 2013. 8  Reuters, Tablet demand drives rise in global smart device shipments: Gartner Oct 21, 2013,  Reenskaug, Trygve, the Model-view-controller (MVC) August 20, 2003, heim.ifi.uio.no/~trygver/2003/javazone-jaoo/mvc_pattern.pdfsahagian, J., retrieved October 19,  SQLite.org, SQLite, retrieved October 21,  University of Connecticut, Assessment primer: Goals, objectives and outcomes: How to write program objectives/outcomes, retrieved October 24,  United States Bureau of Labor Statistics, Occupational outlook handbook: Software developers, retrieved October 24, 2013. Android Mobile App Building Tutorial Seidenberg-CSIS, Pace University This mobile app building tutorial is for high school and college students to participate in Mobile App Development Contest Workshop. BogDan Vatra and Andy Gryc. Qt on Android: Is it right for you? Beginner s Android Development Tutorial!